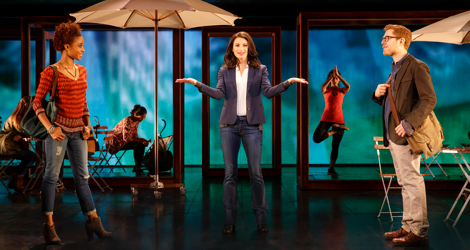 The musical If/Then succeeded on Broadway primarily as a star vehicle for Idina Menzel. Menzel began the current North American tour, now making a stop in Toronto for a month, but left it on January 24 this year. Now we have to see the vehicle without her and it is not a very sturdy one. The premise might seem to be interesting but the story turns out to be uninvolving. The unmemorable songs by Tom Kitt and Brian Yorkey sound so much alike the show feels like more than two hours of reprises. As it is, If/Then functions primarily as a kind of test – both to see if you can stay awake and to see if you can follow the story. There are good aspects to the show. 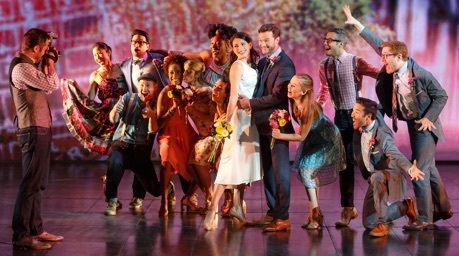 It is not a jukebox musical. It is not based on a movie, live or animated. It attempts to reflect how ordinary people live in the present day. At it’s centre is a 40-year-old woman, not a teenagers, princesses or both. It features not just one gay couple, but two – one male, one female – and celebrates gay marriage. It is racially diverse. It shows that bisexuality may be person’s nature not just a phase. It praises U.S. veterans for their service. Unfortunately, being an original work for the stage and ticking a list of politically correct boxes does not guarantee success. The main flaw is the show’s central premise. Elizabeth (Jackie Burns) moves back to New York City after ten years of unhappy marriage to her husband in Phoenix, Arizona, and plans to start life anew. She sees that there was a point when she was in Madison Square Park when she was faced with two choices – to go to a protest with Lucas (Anthony Rapp), a housing activist and an old friend from college, and later be offered a job as a deputy housing commissioner by another old friend Stephen (Darren A. Herbert) – or to leave with her black lesbian friend Kate (Tamyra Gray) and meet Josh (Matthew Hydzik), the U.S. army surgeon she would later marry. The two paths thus boil down to a choice between a career without love and marriage or love and marriage without a career. The show is severely flawed in theory and in narrative effectiveness. The flaw in theory is the notion that a person can identify the significant fork in the road of life. If you toy with the “many worlds” theory as the musical does, then you should realize that there is a separate world for every choice that you did not make. There is no set series of events after the first choice, but simply more choices. What happens after Elizabeth makes her decision in Madison Square Park is not fixed but just the first in an infinite number of decisions that the show falsely presents as the necessary outcome of each choice. The flaw in narrative effectiveness is that by showing us the two parallel paths that Elizabeth follows, we do not feel like investing out emotions in either one since we don’t know which of them is real and which the missed possibility. The very structure of the musical that intersperses episodes from both paths means both that we don’t really care what happens to Elizabeth in either path and that we sometimes are not even sure which of the two paths the episode belongs to. Book writer Brian Yorkey and director Michael Greif try to keep the two paths distinct by having Elizabeth called “Liz” and wearing glasses in one path and “Beth” without glasses in the other, but both Yorkey and Greif also try to be clever by confounding expectations. A man from one path will go off to the washroom and a different man will come back. Beth will be holding her baby only to have it suddenly become that of her personal assistant Elena (Kyra Faith). This might seem clever but for those trying to keep the two stories separate it is only confusing. An excellent score might help overcome a flawed story, but Tom Kitt’s music is too homogeneous to be memorable. The story offers him the chance to distinguish each life path with its own sound world, but he does take it, and he thus misses out on the chance to distinguish Beth from Liz through music. It’s nice that Brian Yorkey makes the lives of Kate and Anne and of Lucas and David into subplots and gives them their own songs, but since the course of their lives somehow magically depends on Elizabeth’s first decision, we can’t get any more emotionally involved with them than with Elizabeth. As Elizabeth, Jackie Burns proves she is a fine actor and does make some attempt to distinguish her two sides. The careerist Liz becomes outwardly stronger but inwardly brittle while the mother Beth becomes outwardly weaker but inwardly stronger. As a singer she is fine as long as she does not push her voice. When she goes for loudness her voice immediately becomes nasal and piercing enough to cause an ice-cream headache. As a result I found I relaxed whenever she spoke dialogue but dreaded every moment after she burst into song. Anthony Rapp plays Lucas as an overanalytical neurotic nebbish in the style of Woody Allen in his early movies. He, like all of the other main characters does nothing to distinguish his character in the Liz sections from his in the Beth sections of the story. Rapp is lucky enough to have one of the few songs that stands out from the general sameyness of Kitt’s score, namely the 1960s throwback “Ain’t No Man Manhattan” that for a few minutes livens up the stage. infuse Kate with genuine warmth that helps make Kate’s transition to the less comic sections of the musical more believable. Gray shares a characteristic common to most of the cast of unclear diction. In her first song “It’s a Sign”, it’s impossible to know what words she’s singing except for the refrain, and that makes getting into to a brand-new musical even more difficult. The two main exceptions to this rule besides Rapp are Daren A. Herbert as Stephen and Matthew Hydzik as Josh. Herbert and Hydzik are also the only two who seem to have sunk into their characters and play them to the other actors rather than treating the characters as a façade that they display primarily to the audience. Herbert is none other than the multi-talented Toronto actor who won Outstanding Male Performance in a Musical last year for The Wild Party. He lends Stephen an earnestness that none of the other principals even try for. Hydzik’s character who is chosen or rejected depending on whether we’re in a Liz or Beth section also wins our sympathy in a way that none of the other principals do. For all its pretence of portraying everyday New Yorkers today, If/Then with its dodgy premise is really more of a fairy tale. Elizabeth takes one path and gets and instant job as Deputy City Planning Commissioner despite a work gap of ten years. Elizabeth takes the other path and gets an instant husband. If only reality offered rewards like this at the end of every path available. Why exclude the path where the fortysomething woman in New York gets no husband and no career? Besides this, for all its pretence of political correctness, the central character is still white and straight with Kate as the comic best friend of colour and Lucas as the comic gay/bi best friend. Despite its praiseworthy attempts to be original and to be inclusive, If/Then fails as emotionally or intellectually engaging entertainment. If you are a rabid fan of musicals, then you will want to see it for the advances that it attempts to make in form and content. If, however, you don’t want to be bored silly with a nonsensical plot and unremarkable music, then you will have to choose the path that leads to some other show. Running time: 2 hours 40 minutes, including intermission. Photos: (from top) Tamyra Gray, Jackie Burns and Anthony Rapp; the cast of If/Then; Jackie Burns and Matthew Hydzik. ©2015 Joan Marcus.